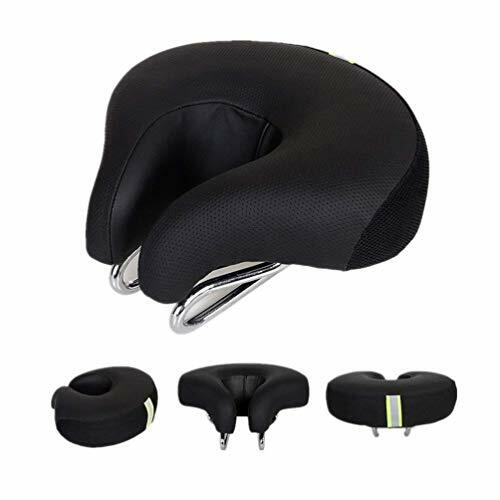 Bike Saddle Special Noseless Design, it will reduce the friction between the hip and cushion. For male, no pressure on the testicle area. For female, no numb on the perineum area. Noseless Design: It will reduce the friction between the hip and cushion. For male, no pressure on the testicle area. For female, no numb on the perineum area. Material: PVC leather+High resReflective strip design for night ridin: It makes your safer. Suitable for MTB,cross-country,BMX and fitness Dynamic bike,spinning,stationary bicycle.ilience polyurethane foam pad + Environmental non-woven reflective stickers + PP bottom shell + Suspension steel arch. Ultra elasticity and make the air to circulate. Reflective strip design for night ridin: It makes your safer. Suitable for MTB,cross-country,BMX and fitness Dynamic bike,spinning,stationary bicycle. GUARANTEED: 3 Months Warranty.If for any reason you are not completely satisfied, we will offer a REPLACEMENT or REFUND immediately! If you have any questions about this product by Zisen, contact us by completing and submitting the form below. If you are looking for a specif part number, please include it with your message.